All of these places are important for people who spend their time there. Furniture is one of the most significant factors that make space cosy, beautiful and practical. Arranging a room is a very difficult task. Interiors and style that we choose will stay with us for long time. That is why the interior for a house should not only match our taste but be useful as well. Our goal is to provide highest quality furniture that characterizes with unique style and practicality. Newest technology enables to arrange the inside of a room in nearly any possible way. 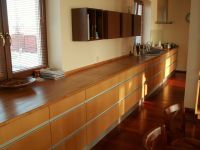 Using wooden plate, solid wood, steel, glass and other materials we can freely organize a space in simple or more complicated way. 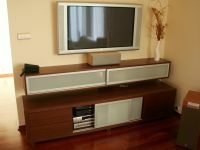 The use of natural veneers like oak, beech or alder can make the furniture look stylish and timeless on the other hand exotic veneers like wenge, zebrano or palisander may give the furniture fresh and original look. 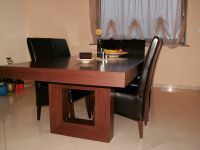 We specialize in designing and producing furniture for interiors for various use – let it be dining rooms, bedrooms, living rooms, kitchens…We can offer traditional and modern furniture. The most important things that our projects comply with are the clients’ needs –style, colour and purpose. We offer nearly unrestricted possibilities in equipping interiors with furniture. We produce all types of furniture pieces like: wardrobes, cupboards, tables, chests of drawers, cabinets etc.